I’ll be the first to admit that I often complain about living in Ohio. It’s either too cold (I loathe the cold), too humid, too rainy… you get the idea. It seems that we really only get about ten perfect-weather days here and the rest of the time, I picture myself lying on the beach while concentrating on my writing. I’ll also be the first to admit that I often say that Ohio has nothing to do and nothing pretty as far as scenery goes. 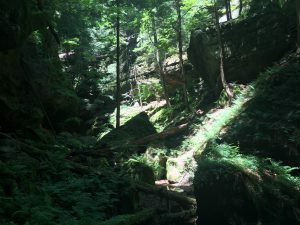 This past weekend, my friend Jenn and I went to the Hocking Hills area. The primary purpose of the trip was to do a Ropes Challenge Course at R Adventure Park. I went into it not exactly knowing what I was getting into but went with an open mind. When we got to the course, I looked up, and my first thought was, “What the hell did I agree to.” However, before I knew it, I found myself getting harnessed up and taken up this monstrosity of a tower, ready to take on the course. Jenn, I must say, worked that thing like a pro. She did every rope challenge with ease and even worked through the most challenging levels each time. I stuck with the ‘easy’ and medium, and when I looked down 200 feet, I may have found a few curse words flying from my mouth. Working through my slight fear, though, and with the patients of Jenn and our guide, I walked the ropes and completed the course with only taking the easy way out once. We were up there for almost two hours, and I have to say that it was a blast! The muscles in my arms and shoulders are most certainly aching, but it’s a good pain. Unfortunately, we were unable to get pictures this time. We agreed that we definitely will be going back and will get pictures the next time. After our ropes adventure, we decided that we hadn’t had enough fun for the day, so we headed to Ash Cave for a little hiking. Jenn showed me where she and her fiance, Val, will be getting married next year at Ash Cave. I must say, it is gorgeous and amazing to view. I can’t believe that I’ve lived within an hour and a half of the cave my entire life and never made the trip to see it. We also drive a little further to do a hike to Conkle’s Hollow. It is also stunning. This weekend trip reminded me that although I often wish that I could live in any state south of Ohio, there really are some beautiful places here too if one just takes the time to look. Hopefully this summer, I have the chance to return to Hocking Hills, and even explore other areas that I haven’t yet seen. I just might be surprised at what I find. Sounds amazing!! Want to check it out! And!!? Was it fun? How did it feel? 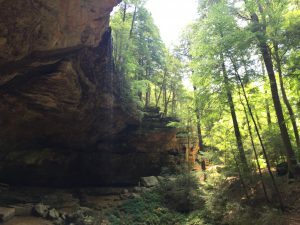 Is hocking hills as beautiful as it looks in pictures? It was so much fun! 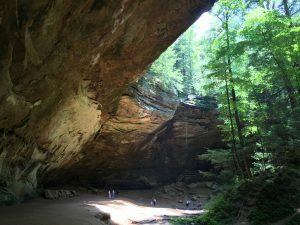 And Hocking Hills is more beautiful than in the pictures!